Construction continues on the new East entrance. Government funding for construction leads to positive changes at Morton East High School. Over the summer, Morton East began its renovation process with the help of Vision Construction and Consulting Inc. With the help of government funds, Morton East and Vision Inc. have worked together to improve the learning environment provided for the students. They began this momentous change, or significant event by installing thirty new air conditioning units throughout the school; along with new classroom furniture, and color-coded hallways. In order to complete this project, the school is receiving 50 million dollars in federal bonds. In a random survey of 112 Morton East students, 55 students reported to like the new changes being made to the school. “We hardly ever put investment back into the building it’s about time we invested. We’ve invested into the sports over the years and I’m glad that we are investing in the school building for you guys,” Morton East Principal Mr.Gamboa said. These investments are being noticed; a monumental, or large amount of the student body reacted in a positive way to the improvement being made. “I like how Morton renovated everything around the school. I think the new desks are really cool because I get to roll around and be more comfortable,” junior Karyme Soto said. Although there are many students who see the value in the changes being made, there are many other students who still wish there could be more changes done to the school. “My least favorite thing is that the first-floor hallway was cut in half because considering the amount of student there are, it’s too tiny,” senior Chabeli Duran said. Morton East students were not the only ones who didn’t completely like the changes being made to the school and classroom paraphernalia, or equipment. “The desks for the students have pros and cons; the trapezoids are difficult due to spacing,” sophomore math teacher Mr. Elkins said. Similarly, with students, the teachers also had diverse opinions on the changes being made to the school. Although not all teachers agreed with the changes, the majority valued those changes. “I really enjoy that they are taking the time to improve the school because it’s all for student focus and enrichment like the new desks; especially that they added the new Promethean boards, I think that it’s going to open up a lot of opportunities for students to learn in a new and fun way,” junior English teacher Ms.Samata said. There’s no doubt that both faculty and administration are in harmonious agreement that the main goal of the new renovations are to provide the best possible learning environment for all students to succeed. “I really want to keep improving every instructional space in this building and provide you guys the best facility possible for no excuses for students not to learn. (There is) no reason not to succeed; we want you guys to be proud of the school you went to,” Morton East principal Mr.Gamboa said. At the end of the day, Morton wants students to always be proud of where they came from, and to be proud of having been a Morton Mustang. 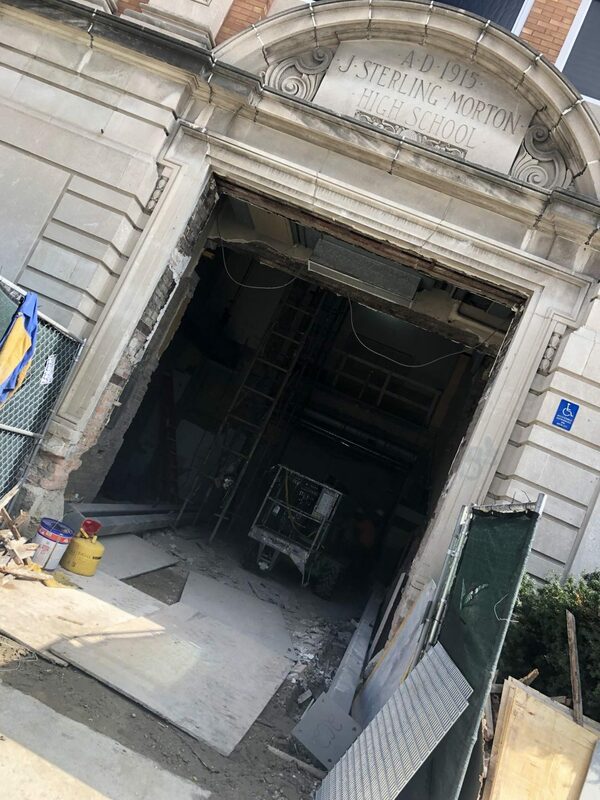 “We want to preserve (Morton East) keeping the building updated and making changes so when you come back, you can appreciate the building,” dean of students Mr.Doogan said.